Avvio has released a whitepaper on personalisation which specifies six guiding principles for hotels to follow in order to optimise their digital profile. Titled The 6 Principles of Personalisation for Hotel Websites, it aims to provide hotels and accommodation providers with guidance for their websites, ensuring their customers have a personalised experience when visiting their site. With artificial intelligence (AI) technology becoming broadly available across multiple platforms, Avvio has produced their latest whitepaper, encouraging hotels to start proactively integrating AI elements into their websites in order to take back market shares from OTAs. The hospitality technology expert has been researching and developing personalisation within hotel websites since 2009, releasing its AI booking engine Allora after many years of data collection and analysis. While many report that direct revenue has grown in the hotel industry, many others have lost market share as the industry has grown at a faster rate globally than the direct revenue category. Accommodation provider websites are often stuck in the hotel brochure paradigm with a few pictures, some copy and a 'book now' button leading to a third-party booking engine. The whitepaper highlights this approach is now out of date. Twenty years after the launch of the first hotel website, Avvio emphasises how improving hotel websites and the technology behind them will help to improve guests' interaction with hotels, enabling them to use their websites for a lot more than just checking prices or room amenities. Frank Reeves, co-founder and CEO of Avvio, commented on the challenges that hoteliers continue to face today: "Hotels are seeing the OTAs and distributors eating into their margins and this is happening with both independent and chain hotels uniformly. "We've been on the hotel side for many years but, seeing the lack of progress with AI and personalisation at hotel website level, we dedicated time developing and sharing these principles with everyone. "We hope these guidelines will help the entire industry to improve the personalisation of website user experience." After defining what AI means for the hospitality industry, the release of Avvio's whitepaper, The 6 Principles of Personalisation for Hotel Websites, marks an important step in the global technology provider's contribution to growing market awareness of the need to improve hotel websites. Frank said: "Personalisation using AI needs to be built into hoteliers' and accommodation providers' websites to ensure that site visitors and prospective customers are attended to at all stages of their user journey." 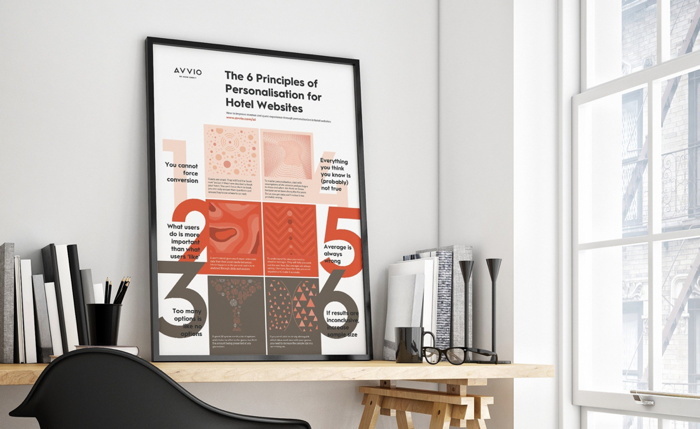 The whitepaper is available online accompanied by a 6 Principles of Personalisation reminder poster on the Avvio blog here. If you are a member of Avvio you may be interested in learning how to optimize your content on our network.